The Humm-Bug no nectar feeders attract hummingbirds by first attracting fruit flies. A favorite treat for the tiny fine-feathered friends. 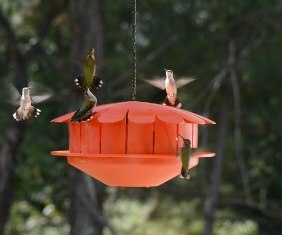 Simply open the two piece feeder, add 2 to 3 bananas and within a few days, hummingbirds will arrive to feast on the fruit flies.